This morning sandwich is made extra easy with the addition of the KRAFT SINGLES. Place 1 muffin half, cut side up, on microwaveable plate. Top with egg; pierce yolk with fork. Microwave on HIGH 40 sec. Fold bacon slices in half; place over egg. 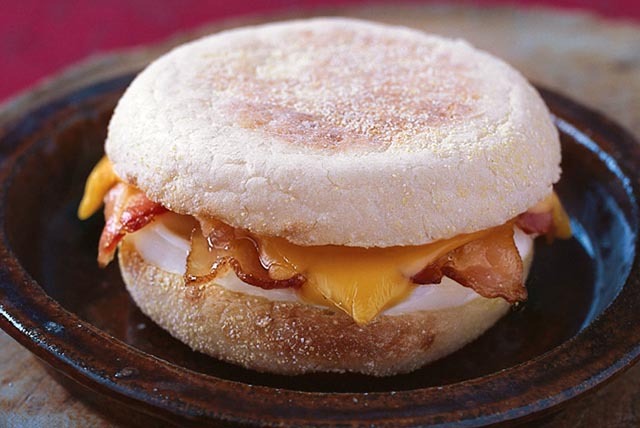 Cover with Kraft Singles and remaining muffin half. Microwave 30 sec. or until egg white is set and yolk is cooked top desired doneness. When your morning is rushed, wrap the hot sandwich in foil and take it with you as you walk out the door to enjoy it on-the-run. Take along a piece of fresh fruit and carton of skim milk to enjoy with this do-it-yourself version of a popular morning sandwich.